Added value with eco trucking. An eco-friendly trucking solution based on customer preference. Today, most customers prefer a shipping partner with a green mindset. Protecting the environment has always been a central part of our daily operations. We want to offer our customers added value in terms of green thinking by providing, not only cost-effective and efficient, but also eco-friendly transport solutions. Our eco trucking service is one of them. The eco trucking service is an innovative solution that uses the latest technology and the opportunities with local regulations. The trucks are 33 metres long and have a maximum weight of 90 tonnes, but their axle weight, turning circle and height do not differ from traditional trucks. Comparing eco trucks to traditional trucks, they can transport your containers while reducing fuel consumption and greenhouse gas emissions by an impressive 40 percent. 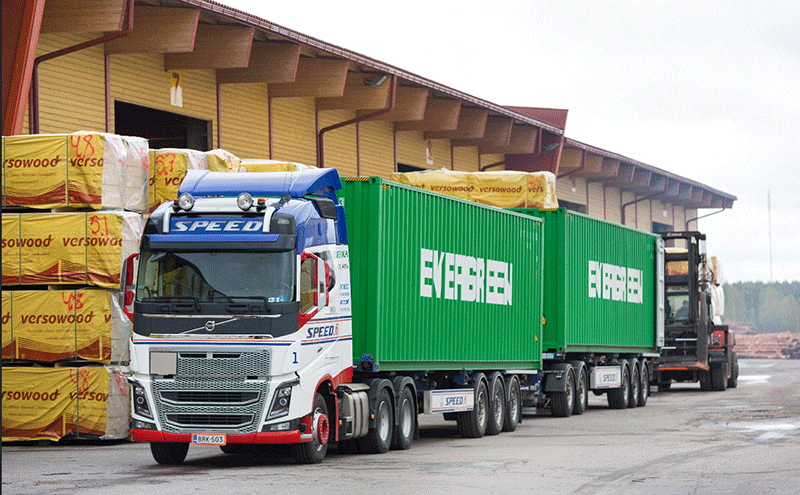 Transporting two 40 foot standard containers normally requires two traditional trucks, which together consume 80 litres of fuel per 100 kilometres. One eco truck alone, can carry both containers at the same time, while only consuming 48 litres of fuel per 100 kilometres. It is clear that the eco trucking solution minimises the negative impact on the environment. The results are concrete, measurable and immediate. Being at the forefront of green thinking and choosing eco-friendly solutions also means staying competitive in your market – leading us back to where we first took off – the added value for your business. 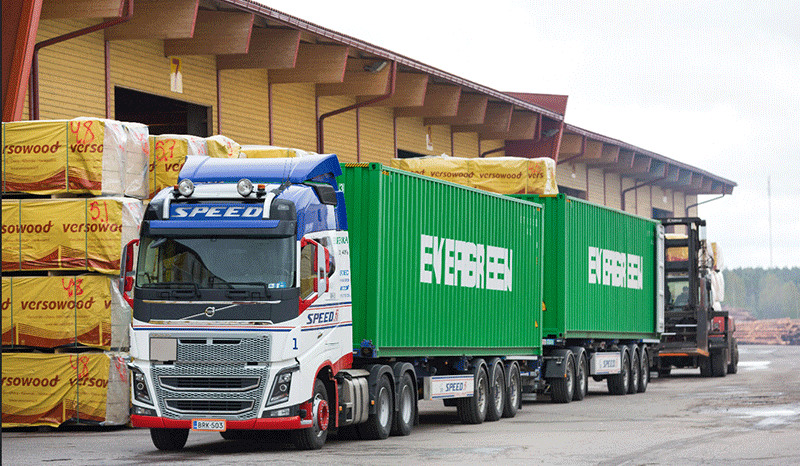 The eco trucking service is currently available only in Finland. It is dependent on each country’s local regulations. As soon as possibilities arise we will be able to offer eco trucking service or other environmental friendly transport solutions also in other countries. Read more about our Green Solutions Concept, how we act as an Environmental Competence Partner and how Evergreen Line enforces eco-friendly methods in providing sustainable marine transportation service. I would like to get in contact with the sales representative for Eco Trucking Solutions.